Beef delight is such a delight. My family loves beef delight and the rich flavors that come together in it. 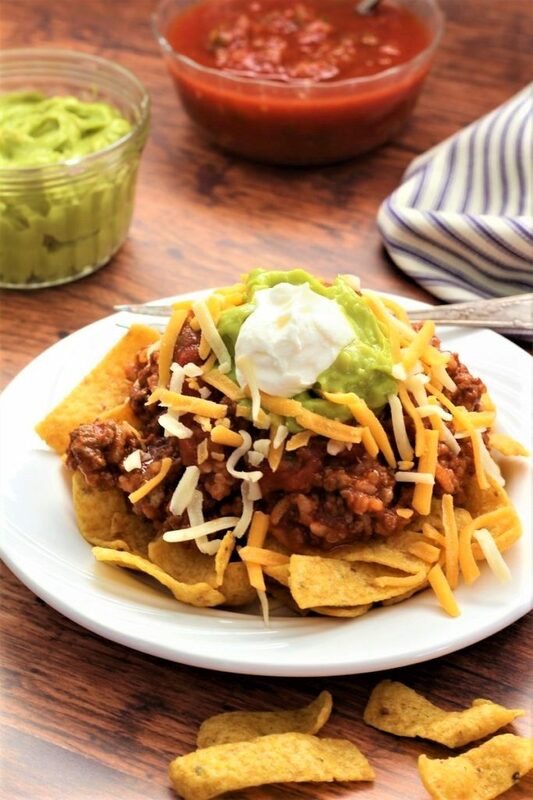 We love to serve it over Frito’s and then you can top it off with cheese, tomatoes, salsa, and sour cream. This makes a whole lot of deliciousness! 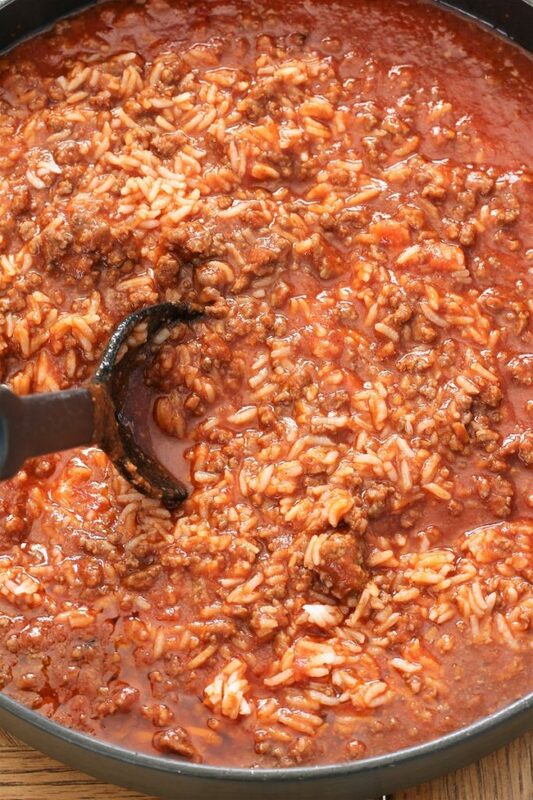 I know that when my son tells me, mom, this is one of the best recipes that you have ever made that it must be pretty darn good. He is very particular of what he will eat, so when you can add a few vegetables, you must take advantage. One thing that I did was double the batch of beef delight. That way we had a few extra lunches and even an extra night of dinner. Who doesn’t love when they already have dinner ready one night and all they have to do is warm it up. I feel that people really enjoy meals that are versatile, ones that you can add to or take away from. This is not an exception to the rule. This beef delight is a great meal to add to one of your dinners to have once a month. So, what is happening at your house? The weather is starting to turn nice and more and more people are out and about. This is a great thing unless you have a dog that is a puppy and he is German/Dutch Shepard. He thinks that he needs to bark at everyone that walks by or that they all want to play with him. Our fence is only four feet high and he can stand on his back legs and reach some of the people. He loves younger kids and thinks that he can grab their hoodies or shirts. Yikes! Not sure what we are going to do about that, but we must get something figured out soon. Sounds like it is time to get some professional help! Yes, either for myself or for the dog! Ha, ha! I know that there are a lot of great people out there that are able to give you ideas on how to deal with this and so I guess it is time to find someone with the know how and the smarts. Another thing that we are having an issue with is that the neighbors just got a Great Dane! My son’s dog is very protective when it comes to other dogs, and the other night the neighbors were walking their dog and it was all my husband could do to hold him back. We do not want him thinking that he can take on any dog that comes along. Then there is my cute little granddaughter who has the cutest smile, but she sure does like to sneak into her mom’s stuff! I am not sure why my daughter got two girls that like to sneak into mom’s purse, make-up and nail polish. Maybe they are like the dog, and the beautiful weather is giving them so much energy that they do not know what to do with all of it! So the almost two year old yesterday got her mom’s, purple nail polish and sneaked over on her dad’s side of the bed and started to polish her toe nails. Needless to say that she got it on the carpet. Oh man, I guess when you have little girls like that that you need a dark brown carpet or hard wood. We never did find anything that took it out very well. So I guess that it is time to get a throw rug. And for my daughter’s birthday, I better get her a make-up table that locks, maybe like a lock with a code and so that way she wouldn’t loose the key, and my grand daughter wouldn’t lose it either. I hope that you are getting all ready for spring and that the weather where you live is bright and sunny and that the flowers are starting to bloom and that life is treating you right. I love getting outside and getting some vitamin-D. I am so excited for you to try making beef delight and I know that you will truly enjoy it. It truly is a delight to eat and a delight to fix. It is very easy for a small group or even a larger group. If you are having a larger group, you might want to ask others to bring a topping and this will make it a lot easier for you! Thank you so much for stopping by and for all of your love and support! Happy Spring!!! 1- You might just want to add a little lettuce if you want. 2- Olives might just be another fun topping. 3- Try avocados in place of guacamole. In a large skillet, cook the ground beef. Add the tomato sauce, tomato paste, oregano, garlic salt, water, salt, chili powder, and the sugar. Simmer for 30 - 40 minutes. It is okay if it seems a little runny, as the rice helps thicken it up. Simmer for another 10 - 15 minutes. 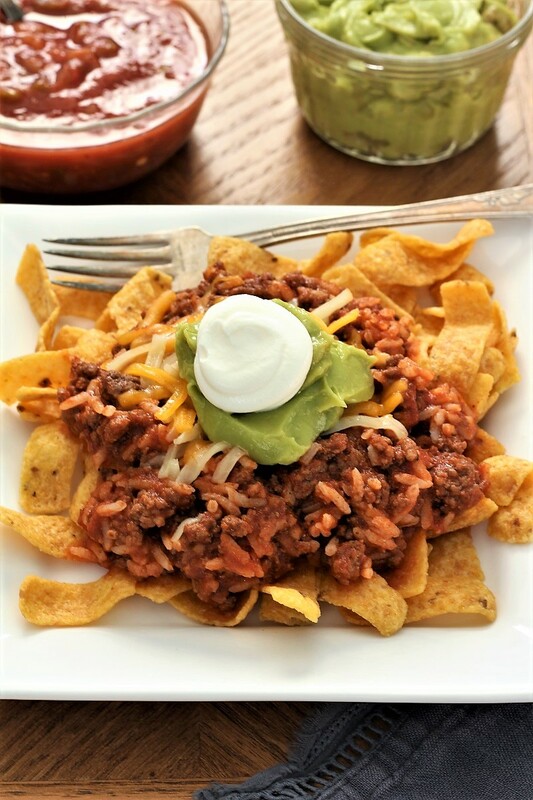 Serve over Frito's and top with cheese, sour cream, tomatoes or guacamole. This beef sounds delightful! I feel like the options are endless on what you can eat with this beef to make it a complete meal! Mmmm!! Thank you Kelly, any time I can find something that my son will eat is a SCORE, and he loved it! Have a wonderful weekend. Thank you for stopping by. Your food is always delicious. Your family is lucky! Oh thank you Janine! You are a sweetheart! Thank you for stopping by! Thank you so much! 🙂 I really appreciate you stopping by!